The 2007 Online Connectivism Conference has definitely got my head spinning. I still haven’t had a chance to post my thoughts on Will Richardson’s presentation on Monday! This post is an attempt to wrap my head around two concepts that came out of the message board during Stephen Downes‘ presentation yesterday. There was a lot of buzz over the interchangeable use of the terms information and knowledge, how they relate to learning and whether connectivism was simply another term for pattern recognition. I see a difference, almost a continuum between the terms: information, knowledge and learning. I envision information as a discrete and independent entity. Information can exist even if it is not known – that the earth was round and not flat was information that existed prior to its “discovery.” Knowledge is the product of consuming, owning or internalizing information. Giving it a personal context. Learning is the discovery of an application of that knowledge to a certain end. Here are two examples, one is for the geeks out there, the other is for the rest of us. In a database, information exists discretely but doesn’t become data until, as input, it is entered into a table. Once information is known by the system, it becomes data (or knowledge). And yet the simple storage of data in a table does not have use to us until we combine it with other data and apply the result to satisfy a query. So data/knowledge is inert until it is used and applied in a specific context to solve a problem (for some reason, this reminds me of potential versus kinetic energy). The application of knowledge to satisfy a problem constitutes learning and as this process recurs our learning expands geometrically. With the Lego example, information is much like a Lego block, in that you may not own Legos but they still exist. Holding a Lego block or a number of blocks in your hands, that’s knowledge. But until you apply a context and then use those Legos to build, to solve a problem – that to me is equivalent to learning. As is the process of disassembling and reassembling those blocks to create new objects based on new contexts and new problems seeking solutions. Much of the message board discussion spoke of pattern recognition as a fundamental component of connectivism. 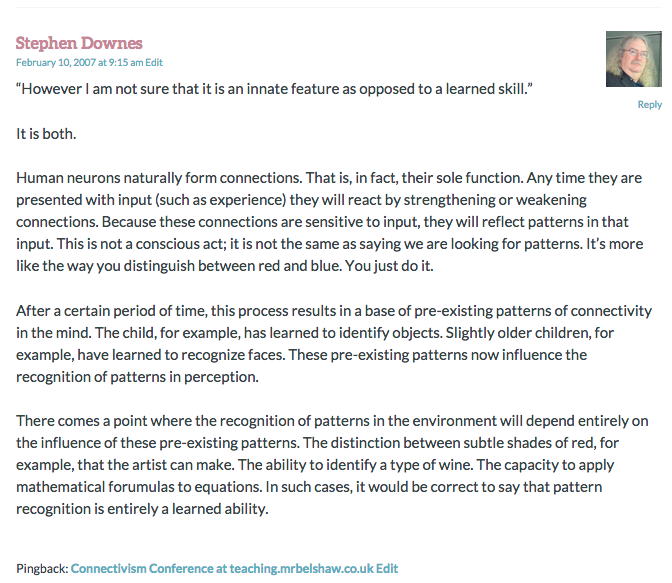 We agreed that pattern recognition is contigent upon context and is a basic aspect of the human learning process. However I am not sure that it is an innate feature as opposed to a learned skill. Is the ability to recognize patterns not dependent upon our ability to first develop associations, relationships, connections between seemingly disparate pieces of knowledge? It would seem to me that pattern recognition is a meta-skill built upon connective skills. But I’m still trying to wrap my mind around all of these incredible ideas that the participants have been throwing out there. So Stephen, if you happen to come across this rant would you mind tossing your thoughts my way?